Dr. Peterson is Chief of Metabolic and Bariatric Surgery and a Professor of Surgery at the University of Texas Health San Antonio in the United States. He is the immediate Past President of the Texas State Chapter of the ASMBS. He serves on multiple committees on the ASMBS and Chairs the Communications Committee, is the immediate past Chair of the Public Education Committee and serves as the Co-chair of the Program Committee. He serves as the Social Media Editor for Surgery for Obesity and Related Diseases (SOARD) and runs the SOARD Journal Club on Facebook. 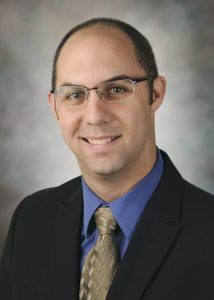 Prior to his time at the University of Texas, Dr. Peterson did his Minimally Invasive and Bariatric surgery fellowship at the University of Southern California (USC) in Los Angeles. He then entered into active duty service in the United States Air Force and was the Consultant for Bariatric Surgery to the US Air Force Surgeon General and ran the largest bariatric surgery program in the US Department of Defence.